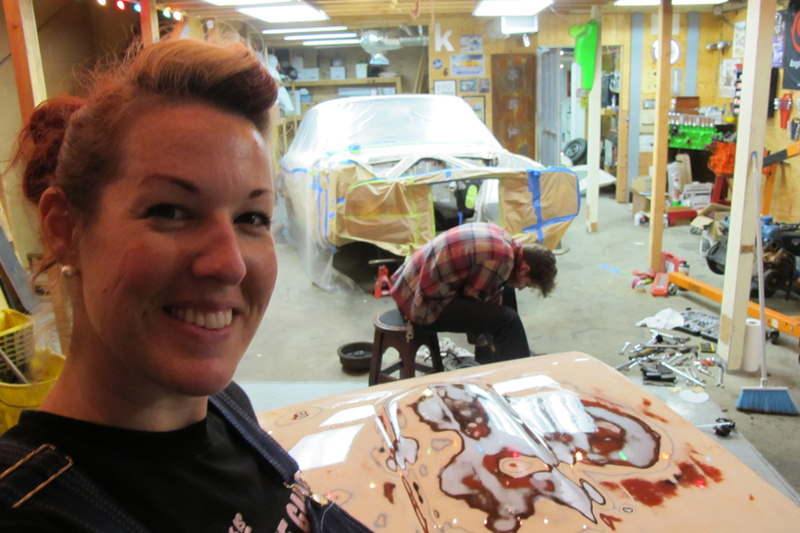 After masking the car, we didn’t want to apply primer that we’d be smelling all night while we slept. So instead Ethan turned back to cleaning suspension parts and taking apart the brakes while I shined the grill and headlight rings. I’d finished shining the grill with 0000 steel wool and was considering turning in for bed a little early when I remembered the hood. If Ethan planned on applying primer while I was away at work tomorrow, I wanted the hood to be done then too. I’d already sanded and done some bodywork on the top of the hood with my car club the other weekend, but the bottom hadn’t been touched. Before primering the bottom of Falcon’s hood it needed sanded, cleaned, and rust-treated. So I set to work in a flurry to get that done in time for bed – I discovered that when sanding, being in a hurry kind of helped. I worked methodically, keeping track of what area I’d covered – and when my hand was tired and wanted to rest, I just plowed on through. Bedtime got set back more then I would have liked, but it’s a small price to pay. As an added bonus…the longer I stayed working in the garage, the longer Ethan did!